Surveyors should provide you with a professionally prepared report that can be accepted by your bank and/or insurance company. Talk with prospective surveyors and ask questions! What does the survey include and what type of reporting format is used? Do they use ABYC, NFPA and USCG standards in their surveys? How much will the inspection cost? How long will the onboard inspection take? A thorough inspection will not be rushed and will depend on the type of survey required based on vessel size, equipment, and onboard systems. There may be additional services available such as engine surveys, oil analysis, galvanic and stray current corrosion testing, ultrasonic testing, moisture testing and other nondestructive tests. There may be additional charges for these and other services. Well conducted surveys can provide good information on the vessels’ condition, but they are not guarantees. The surveyor reports the condition in accessible areas only as it exists at the time of inspection. This is the most comprehensive type of inspection and is strongly advised when purchasing a new or used vessel. Condition and overall operation of the vessel should be examined. This covers structural integrity, electrical systems, the propulsion system, the fuel system, other machinery, navigation equipment, miscellaneous onboard systems, cosmetic appearance, electronics, and overall maintenance as well as an out-of-water inspection and a sea trial. This inspection is performed so that the insurance company can determine whether or not the vessel is an acceptable risk. They are interested in structural integrity and safety for its intended use. Most insurance companies require a survey on older boats. They will also want to know the vessel’s fair market value. The surveyor can be retained by an insurance company to determine the cause of a loss and determine the extent of loss related damage and may be asked to recommend repairs, review estimates, and determine the pre-loss value of a vessel. A vessel owner can retain a surveyor for the same purposes, but for the owner’s behalf. Arrange to present a clean, shipshape boat, and have all papers and miscellaneous gear ready. If applicable, you will need to make arrangements with the marina to haul the vessel for bottom inspection and retain a captain for sea trials. Lockers and cabin areas should be cleared of all miscellaneous gear. The surveyor should never be asked to prepare a boat for inspection. The surveyor may request minor dismantling of interior ceilings, headliners, flooring, etc. in order to gain access to the suspected areas. 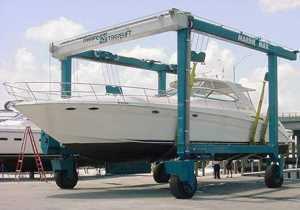 Random removal and examination of below-the-waterline fasteners on wood boats may be required. Any dismantling and reinstallation of parts should be performed by qualified personnel and is the responsibility of the person ordering the survey. SAMS® has two membership classes of marine surveyors. The Accredited Marine Surveyor (AMS®) and the Surveyor Associate (SA). Listed below are the items required to apply for membership. A more detailed description will be included in our Membership Request Packet. If you are interested in becoming a SAMS® member, please send your request to samshq@marinesurvey.org, and include your full name and mailing address.